Did you know that Tourism is a $138 Million yearly industry in Eastern Manitoba? These tourism dollars are spent on everything from accommodations to fuel, and groceries to fine art. Did you know that you don’t have to be a designated tourism business to earn some of this revenue for yourself, but also help your community thrive and grow? 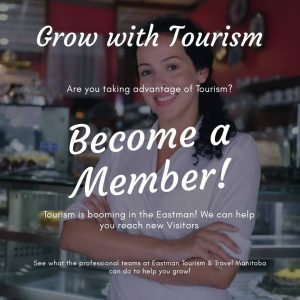 Tourism in Manitoba is growing and you can be a part of that whether you own a gas station or a repair shop, a grocery store or an art studio, all you need to do is market to the right people and become part of the growing Eastman Tourism Partners. Eastman Tourism strengthens the tourism industry by developing, marketing and building capacity of regional assets and travel opportunities. Eastern Manitoba is a premiere tourism destination where travelers are openly welcomed and entrepreneurial spirits prosper. COLLABORATION We believe in the power of teamwork and will work in partnerships to maximize impact. LEADERSHIP We will lead in developing and marketing Eastern Manitoba’s tourism experiences and in providing support to maximize tourism potential. ACCOUNTABILITY We will deliver what is promised and will continually strive to improve productivity and overall efficiency. SUSTAINABILITY We will contribute to the economic, social, cultural and environmental well-being of Eastern Manitoba. Act as the central agency and collective voice as the official Regional Tourism Association in Eastern Manitoba. Provide quality visitor information through a wide variety of regional marketing initiatives. Provide support to local tourism operators, agencies and events to enhance/develop knowledge, skills, and quality. Assist with tourism product development by bringing additional resources, products, experiences, jobs and businesses into the region. Facilitate networking, collaborations, partnerships and opportunities within communities, related agencies, and operators that strengthen the tourism industry.